Designed for Skid Steer loaders, the SSGR-84 features a lower profile design than standard brush grapples making access to the operator’s seat easy, even on units with a cab door. Lower tines with gripping notches of 1” material with weld-on tine points allow the grapple to pick-up debris while leaving the dirt behind. The dual upper grapples open a full 59-inches allowing the operator to maximize the amount of debris held. Two 2” x 10”, 3000 psi cylinders are mounted behind the mainframe to operate the upper grapples, while protecting them from harm. Hoses are routed through the mainframe providing protection for them. View our literature. Lower profile provides easy access to the operator’s seat, even on units with a cab door. 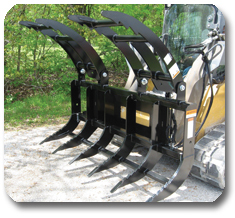 Lower tines have weld-on tine points, allowing operator to go under logs/	brush for easyclean pick-up. Gripping notches in upper grapple and lower tines help to retain materials in the grapple rake. Pivot points have lubrication capabilities for long service life.